The poor Egyptian project manager’s head was spinning after an intense three days of briefings from me. I suspect he started out thinking the project would be interesting but then suddenly realised how much he didn’t know about both project management and cultural change management. My guess is I’ll be requested to provide ongoing support. When talking to one of my closer Saudi colleagues I mentioned I’d read the ban on women driving vehicles in Saudi Arabia might soon be lifted. He informed me that if this occurred he would forbid his wife and daughter to drive. My initial thought was “Backward MCP” and then I realised I was being very judgemental and probably prejudice. As I was thinking this he explained the ban was for their own safety. More prejudice thoughts on my part about a perceived inability of women to drive a vehicle. He then went on to explain his wife or daughter could be attacked by ultra cultural zealots if they were seen driving a vehicle in Saudi Arabia. He then mentioned his wife drives when they visit Syria and Dubai. I felt suitably chastened for my biased thoughts. I should also mention the hand made pens we purchased from James & Deb (nb Lois-Jane) as gifts were very well received by my Saudi colleagues. It proved to be an excellent choice. Thanks James & Debbie. My Saudi host had very kindly arranged for me to vacate my room at the Holiday Inn at the later time of 9pm. This gave me somewhere to have a shower and change before departing for the airport and 1.00am flight to Heathrow. I discovered the Holiday Inn is adjacent to the main retail computer area (bazaar) in downtown Riyadh. With time to spare before my departure I decided to go for a local walk. The computer area is a rabbit warren of small stalls, mostly staffed by Indians or Pakistanis. I needed to wait for prayers to finish before the stalls re-opened. I’d failed to remember the country stops three times a day during working hours. And Riyadh must have the highest density of mosques of any city. 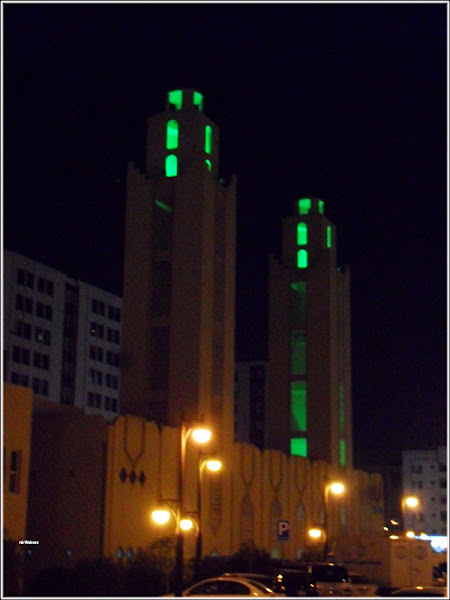 Behind the bazaar was a medium size mosque with illuminated green towers. Whilst the stock In the stalls was new (ie, unused) it was mostly older than the models you can purchase in the west (ie, new, old stock). It was also the same price as the UK. .
It’s very hard to go more than one block without passing a mosque. The journey to the airport was long and circular. The direct route isn’t necessarily the quickest as Riyadh’s roads can be quite congested. We ended up going south and then east before turning north to reach the airport which is located on the northern fringe of the city. At the airport before you reach the check-in counter all the bags go through a security Xray machine manned by a Saudi . The machine doesn’t have much value because I’ve yet observed the machine operator looking at the display. Usually he is gossiping with a colleague or talking on the phone. It was obviously my unlucky day because on receiving my boarding card I realised I’d been allocated one of the worst seats on the aircraft. Middle seat, in the middle row, towards the rear. However there were very few people in the departure lounge and I reasoned that because it was New Year’s Eve the aircraft had only a few passengers. WRONG AGAIN! When I boarded the aircraft there was an announcement advising it was a full load. My luck got even worse when I reached my seat to find myself squashed between two huge Saudis. Both of them overflowed their seats oozing into my space. Then the Saudi seated immediately in front of me kept reclining his seat into my face despite requests from the crew not to do it. Consequentially I didn’t manage to get any sleep on the flight. It’s now 3.30pm and I haven’t slept since 3.00am yesterday. I’ll go out like a light tonight! I thought I’d try getting through UK Immigration by using the British and EU passport holders queue. The aliens queue being comprised of Saudis who were being processed very slowly. On handing over my NZ passport and UK Indefinite Leave to Remain ID Card I was informed I needed to queue with the other aliens. They take your money and allow you to permanently stay; but it doesn’t mean you’re British! The 6.00am London underground train was almost empty and the carriage didn’t fill during the journey to Kings Cross/St Pancreas Station. Then I realised it was New Years Eve and all the lemmings were on holiday. A brisk walk to Euston Station. 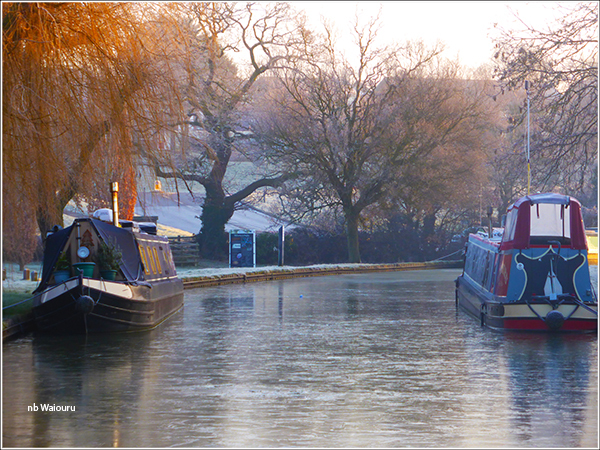 First time I’d been outside since arriving at Heathrow and it was very crisp with frost and ice about. A major change from the temperature in Riyadh. No doubt the Saudi’s on the flight were suffering! I arrived at Euston Station three hours early for my train (10.03am departure). Because I’d purchased an advanced cheap off-peak ticket I either had to wait the 3 hours or purchase a new, and more expensive ticket. Being a miserable git I elected to wait. It was cold! I arrived back at Waiouru around 11.00am to find her sitting in a frozen canal. Jan couldn’t wait to tell me I know when to leave her to cope solo with the bad weather. 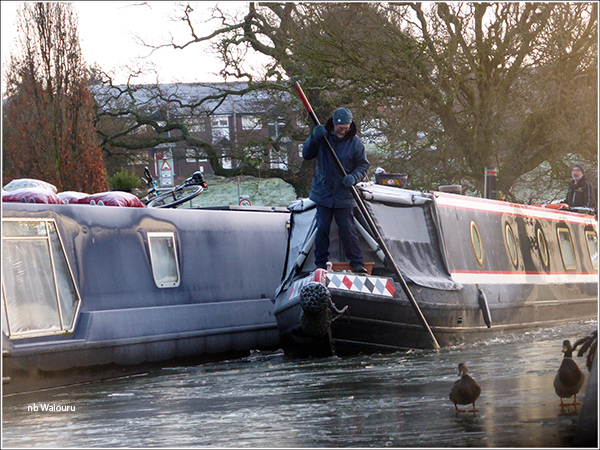 Apparently a number of boats had passed smashing their way through the ice. All but one had done it at speed and Jan now has concerns about the condition of our blacking on the port side. 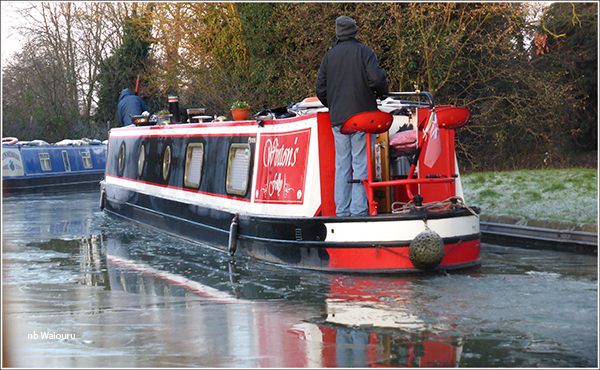 The one boat that passed slowly had a two man crew with one of the crew in the bow breaking the ice into small pieces using the boat pole whilst the other steered. As the boat got closer Jan recognised both the boat and the steerer. Hopefully it’s not a case of breaking the ice all the way to Stone! After lunch I walked to the Aldi at Central Park for a few essential supplies. On a sadder note I guess you know the reason for Wiltons Folly heading by? I've managed to stay awake until now but this will be the final thing I do before bed. 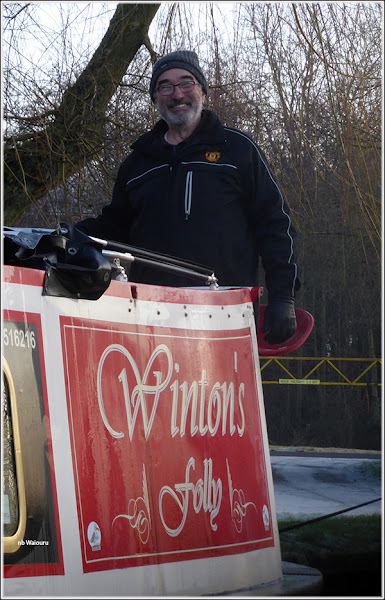 Yes, we have read other blog posts explaining why Winton's Folly is being moved and hope everything works out well for everyone.